In 2005, this device was created for a European car manufacturer to resolve a major problem with one series of cars which had (and still has) major problems. Although the Harmony Super Charger solved all of the problems with stability, performance, electro smog and the effects of the internal proportions inimical to human health and safety it was never taken up for that model. The reason was very simple - cars are built using 17th century Newtonian Physics. The Harmony Technology is built using 21st century Quantum Physics. The technical department at the car manufacturer simply said “we don’t understand it and we are, therefore, not going to use it”. That it resolved all the problems was not considered to be a relevant criterion for making the decision. What this means for you, is that you get to use a device which is, in its technology, too advanced for a very large car manufacturer! The concept which gave rise to the Harmony Super Charger and other subsequent devices arose out of the question “how can we do everything from one central point instead of having to use several of the Harmony Evolutions?” The solution was to make a much more powerful processor which could do exactly this. A biological system will self-correct when given the wherewithal to do so. A mechanical system has its problems permanently built into it at manufacture and these cannot be altered in any meaningful way. The application of the Harmony Technology has, therefore, a fundamental difference dependent upon where it is being used. A biological system needs merely a correcting impulse and the system will, itself, take up the correction. It will then multiply it and carry it into the system architecture where it will trigger a re-organisation which expresses better or optimised function. A mechanical system cannot do this: It has no capability to self-correct because limited human intelligence has never even thought about trying to build this in. So, if a machine has inefficiencies built into it, such inefficiencies will continue until the day that the machine falls apart. All machines are inefficient because the principles of creation have not yet been widely understood. Machines are an attempt to replace creation with simplified technologies. 10% efficiency for such technology is considered to be very good. Even a 2% increase in efficiency is, therefore, actually a 20% increase in effective value! By applying a constant correction, significant increases in efficiency, durability and environmental strain are easily attained. To apply constant correction instead of a correcting impulse, a much larger processor is necessary. 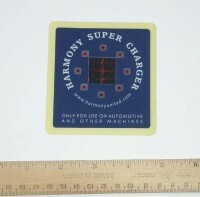 The Harmony Super Charger is the first such device to be built. Over nearly a decade, the Harmony Super Charger has proved itself to be a major tool in improving the efficiency of mechanical devices of all types. There is even a special website for Automotive applications here. Of course, the size and the mass of the machine will, to a large extent, determine which of the Harmony Technology devices is best appropriate. For machines up to about 25 lbs. (11 kg.) weight, including devices making use of Quantum Field effects such as the ABPA machine from Dr. Sutherland - the Harmony Evolution. For machines, including road vehicles up to about 5 tons weight - the Harmony Super Charger. For larger machines, including aircraft up to 80 tons weight - the Home and Office Harmonizer.